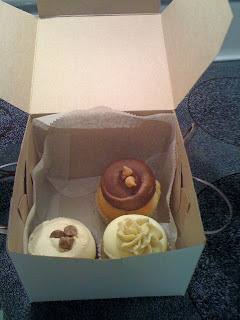 A few weekends ago, I took a mini road trip with a few of my gal pals to Hudson in search of the perfect cupcake. My friend Kelly had been raving about Main Street Cupcake's cupcakes for as long as I could remember, so we planned a special trip just to check out this little cupcakery. Being the food lover that I am, I bought 4 cupcakes - my litmus test/favorite - carrot cake, caramel macchiato, peanut butter chip, and chocolate peanut butter. I tried the carrot cupcake first. (I managed to restrain myself and wait to eat the cupcake until I got home - it was really difficult to wait!) I'm a pretty picky cupcake eater, and if the cupcake is too hard, or soft, or has too little or too much frosting, I'm normally not a happy camper. But this was the perfect carrot cupcake. The cake was perfectly soft. The frosting was creamy and delicious but not overpowering. 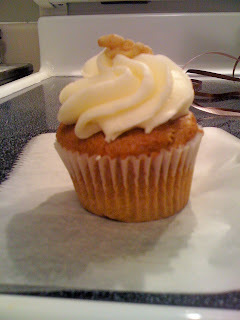 And overall, the cupcake was a good size - not too big, not too small - the perfect snack sized cake. The next day I shared the remaining cupcakes with my boyfriend, splitting each of them in half. Although I enjoyed the carmel macchiato (I love just about anything carmel), I thought the frosting was a bit too sweet. The chocolate frosting on the chocolate peanut butter cupcake was good, but not the best I'd ever had, but the peanut butter chip cupcake? That was fantastic. There were chocolate chips in the actual cupcake. They little chocolate morsels were a nice surprise and added to the decadence of the cupcake. Of those three flavors, the peanut butter chip was by far my favorite. (and my boyfriend's, too) I have to note that the cupcakes weren't nearly as moist and spongy as the carrot cupcake had been the day before. I know now that if I buy a cupcake, I should eat it ASAP so I can enjoy the perfect cake and frosting consistency. Although I really enjoyed the cupcakes I had from Main Street Cupcakes, I think I might have enjoyed the cupcakes I had at Tremont's A Cookie and a Cupcake a little bit more, just because of their filling. I'd definitely go back to Main Street Cupcakes to try some of their other flavors, though! Have you tried Swirl at Crocker Park? (it sounds like you might be a far eastsider though, so maybe not). I have been on a cupcake trying spree lately myself and I find theirs to be the one I want to try again! Cookie and a Cupcake was ok I thought. But it seems with cake, every person is very particular about what makes it good in their opinion!! I haven't gone to Swirl yet, but I'd love to check it out. I went to MSC over this past weekend and cupcakes that were good but not phenomenal. My search for the perfect cupcake continues!